An 8-year long case charging Oleg Deripaska and his Russian Aluminium (Rusal) group with fraud and corruption in acquiring aluminium assets, gas and electricity supply and port outlet in a rigged privatization scheme has ended in Deripaska’s defeat and the loss of his assets. The court ruling was issued on Friday, July 6. In Nigeria. On the eve of the start of Mikhail Chernoy’s (Michael Cherney) trial for recovery of his 13% shareholding in Rusal, to commence in the UK High Court today, the Nigerian Supreme Court judgement by a unanimous 5-judge panel is automatically endorsed by the US federal court, which had ceded jurisdiction over Rusal for the claim, on condition Deripaska submitted to the Nigerian courts. The ruling cannot be appealed; and for an asset which cost $3.8 billion to build, it is the most costly defeat Deripaska has suffered in the international courts to date. The court has ruled it was illegal for the Nigerian government’s privatization agency, the Bureau of Public Enterprises (BPE) to sell the Aluminium Smelter Company of Nigeria (ALSCON) to Rusal, and it has nullified the deal. Rusal executives hadn’t been expecting the Nigerian defeat. Over the weekend, the Nigerian press has been reporting a Rusal country representative, Albert Dyabin, as saying the company would be bound by the Supreme Court verdict. In Moscow, as litigation from former partners, shareholders and former employees exposes Deripaska’s management mistakes, his senior executives have begun fighting among themselves. Following the collapse of a private arrangement between Deripaska and the President of Guinea, Alpha Conde, Yakov Itskov, who runs Rusal’s worldwide raw material procurement, recently asked Deripaska to discharge Victor Boyarkin, who heads Rusal’s security division. Itskov is reported to have told Deripaska that Rusal’s troubles in Africa reflect the failure of Boyarkin’s strategy of combining soft inducements to politicians to cooperate, combined with hostile measures if they won’t. According to another Rusal insider, problems from mismanagement and corruption are also brewing in the South American republic of Guyana, where Rusal bought a bauxite mine and new mineable reserves in 2006, and where there have been production strikes, widespread protests, and Chinese competition. Rusal sources believe Boyarkin has survived the challenge because key government officials and shareholders have supported him – at least until the new challenges emerged in recent weeks from Victor Vekselberg and Sergei Stepashin. The Rusal prospectus, issued in December 2009 for the sale of the company’s shares, reported its takeover of the Nigerian government’s 77.5% stake in ALSCON in December 2006, followed by the purchase of a German-held stake of 7.5% in 2008. The Nigerian government retained 15%. Rusal’s winning bid was $250 million in shares, conditions, and $130 million in cash; with this Rusal managed to arrange with the Nigerian government’s privatization agency to overrule a $410 million cash offer by the Bancorp Financial Investment Group Divino Corporation (BFIG), a Nigerian-American group based in Los Angeles and headed by Reuben Jaja. Rusal announced “the $250 million purchase price will cover the purchase of the shares in Alscon, as well as the dredging of the river. The company, together with Ferrostaal AG and the Government of Nigeria, also plans to invest an additional $150 million over the next three years to complete, refurbish and modernise Alscon.” That was in 2006. In the Rusal share prospectus, the company said it had invested $76 million, less than half its promise. On account of the conditions tied to the bid, the Nigerian government ended up promising to subsidize Rusal’s plan for the smelter with more money than Rusal itself promised to pay. BFIG launched its first claim in US federal district court (Manhattan) charging Rusal with conspiracy to commit fraud . 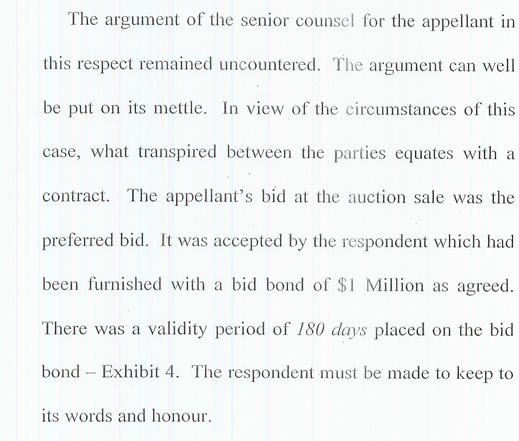 Rusal counter-charged that “this case is entirely without merit and now welcomes the court’s decision.” What that meant was that the US federal judge William Connor, followed by three appeals court judges, ordered Rusal to face the Nigerian courts, rather than the US courts, on BFIG’s claims. Here is the full story, as it developed over the years. The judgement of the Nigeria’s highest court, delivered by Justice John Fabiyi, runs to 59 pages. It overrules decisions by the trial court and the Court of Appeal, which went in favour of Rusal’s deal with the Nigerian government. The final judgement concludes there had been a binding contract for sale of the state shareholding in ALSCON to BFIG before Rusal stepped and persuaded BPE to reverse itself. BPE had improperly and illegally intervened, the court has decided, and that action has now been reversed. The Nigerian government was also ordered to pay court costs of 50,000Nairas ($311) to BFIG. Acccording to the Rusal prospectus. “ALSCON is currently a loss-generating asset and is not expected to become profitable until a capital investment program has been completed with the smelter reaching its full capacity of 197 thousand tonnes per annum. A feasibility study for internal investment approval was completed in September 2008. The program requires an investment of approximately US$298 million over the period of 2009-2011, of which US$76 million had been spent as of 30 June 2009. The debt restructuring agreements generally prohibit the Group from incurring capital expenditure in relation to this program through the end of the override period but permit the Group to fund the program on a project finance (non-recourse) basis or through certain equity investments in the project. The Group is currently considering a disposal of 50% of its interest in ALSCON to a strategic investor.” The same prospectus reported a book value for the Nigerian assets as $183 million in 2007. BFIG’s court case deterred anyone from buying. Rusal has yet to disclose Friday’s loss to its shareholders on the company website.